The Maeotian of Eastern Paratethys corresponds to the interval of the magnetochronological scale from the base of the subchron C4Ar2n to upper parts of the Chron C4n (9.6–7.5 Ma). Fission-track dates of Maeotian deposits are in general agreement with paleomagnetic chronology. In the continental stratigraphic scale of Western Europe this interval corresponds to zones MN10 (save the lowermost parts), MN11, and MN12 (upper part). Taking into account age estimates of MN zones boundaries established in Western Europe, the East European mammalian localities of Ukraine and Moldova can be stratified as follows: MN10, Raspopeni, Grebeniki, Novaya Emetovka 1, ?lower bed of Ciobruci; MN11, Novaya Emetovka 2; MN12, Cimislia, Ciobruci upper bed, Cherevichnoe, Tudorovo, Dzedzvtakhevi, and sites in the lower Pontian deposits. The faunal criteria used to distinguish MN zones in Western Europe cannot be completely applied to sites of the Eastern Paratethys because of paleozoogeographic distinctions between West and East European provinces. Specific criteria of zone boundaries definitions should be developed for the East European province. Original Russian Text © E.A. Vangengeim, A.S. Tesakov, 2008, published in Stratigrafiya. 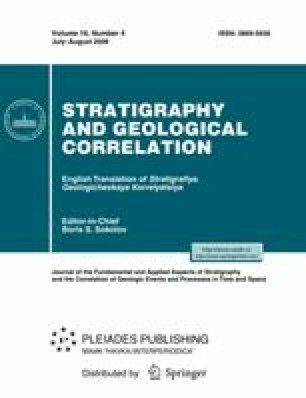 Geologicheskaya Korrelyatsiya, 2008, Vol. 16, No. 4, pp. 95–109.